and Regular Show #1 at 56. Previews for May featured an interview with Stan Sakai; he’s finishing up 47 Ronin soon and looking forward to getting back to Usagi Yojimbo. Before that, though, he mentions that he wants to do a non-canonical mini-series featuring the ronin rabbit versus the Martians from The War of the Worlds. So that’s something to look forward to. Also, remember Free Comic Book Day is Saturday, May 4. 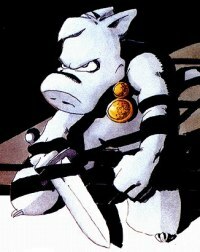 Cerebus: High Society, part of Canadian comic-book artist Dave Sim's epic comic series Cerebus, is set to be released in an e-book format. Cerebus ran over December 1977–March 2004. In its 6,000 pages, the series chronicled the adventures of an anthropomorphic aardvark. Initially a parody of sword and sorcery comics, the series explored such topics as politics, high society, and religion. The High Society subplot is now being released as a "combination e-book, audio book/digital graphic novel/oral history/weekly serialization" after successfully raising over $33,000 in a Kickstarter campaign (with 25 days to go). As the initial $6,000 goal was exceeded in less than nine hours, Dave Sims has promised to release all the Cerebus books as e-books.